This emerald green dress from Atonement (2007) could be the most famous item of clothing on film in the last decade. In fact, rather surprisingly, it was recently voted ‘Best Costume of All Time‘ by Sky Movies and readers of In Style; surprising because, despite its multifaceted beauty, there are many other magnificent costumes out there more deserving of the title. Nonetheless this long, slinky evening gown from a mini-epic set predominately during the mid-1930s to early 40s is an extraordinary achievement. It is not only a work of art to look at; it also precisely informs the narrative. Costume designer Jacqueline Durran created the dress from scratch. Her intention being to steer away from the ‘scruffy, slumpy and bumpy’ style typically adopted by upper-middle class families during the period and create something of utmost couture instead. The look was ‘heightened perfection’. Briony Tallis’ (Saoirse Ronan) unspoiled memory of events before her resentful jealousy ruined so many lives, including her own. The rich emerald green colour was specially requested by Atonement’s director Joe Wright. It was a combination of tones: Lin black, green organza and green chiffon. An unusual choice for film, green is thought to render viewers uncomfortable. This unnerving effect is why Alfred Hitchcock clad Tippi Hedren in an omnipresent green suit for The Birds in 1963. Supposedly green most directly alludes to ‘temptation’, but in truth its meanings are numerous and often contradictory. The Guardian newspaper suggests the colour is used as a left motif throughout Atonement. This seems credible: the fields of France, the water engulfing Ballham tube station, the kitchen walls of the Tallis estate. Yet it is equally important as an indication of character. Keira Knightley as Cecilia Tallis is seen wearing only variations of green (apart from her regulation nurse’s uniform) following the incarceration of her love Robbie (James McAvoy). Subscribing absolute denotation to the colour is impossible, so by very definition it becomes mysterious. Green symbolises both Cecilia’s mood at the onset of the dinner party and her sister Briony’s envy. Later it comes to represent Cecilia’s cursed existence. Yet perhaps Cecilia’s dress was never this colour at all..? Briony may have used green in her novel to indicate motive for her actions. Floor length evening gown in emerald green silk. Flowing bias cut bodice with bow detail perforated in the neckline. Loose through the bust, spaghetti straps over the shoulder. Wide waistband wrap, gathered at the rear; knotted at the front and left to hang. Straight cut circle skirt with high front slit and rear train. 18k white gold and diamond star hair studs with matching ‘Cosmos’ bracelet both by Chanel. Gold cage front leather shoes custom made by Bally. This dress is deceptive. Although simplistic in terms of a lack of appliqué, the complexities of the silhouette would have made it an arduous task to piece together and fit. Seperate from the skirt, the bodice and waist have been pulled in tightly (ten bodices and four skirts where used in filming), possibly with the aid of hidden corsetry or even a concealed zip. Moreoever zips were just becoming popular in haute couture during the 1930s, before falling foul to wartime restrictions in the 40s and not reappearing again until the mid-1950s. The dress is left longer at the back making a train which, under strict instructions from Wright, billowed perfectly with each step. For the 1931 film Palmy Days, Coco Chanel was under brief contract with MGM. Ever the perfectionist, Chanel made several versions of one outfit so she could control exactly how it looked in each shot. As with Atonement, this is ‘heightened perfection’; flawlessness given greater significance than realism. And yet Jacqueline Durran’s creation is not historically inaccurate. It has many identifiable details of the time: backless, train and risqué front slit to name but three. The adoption of the Hays morality code in 1930 required actresses to be more covered up onscreen than ever before. Sartorially the watchword became ‘suggestion’. What the public couldn’t see could be suggested by tightness and clever bias cutting to highlight curves. Although realistic in real life, Durran’s low and loose neckline would have probably struggled to make it past movie censors of the time. In overall style this dress most strongly resembles the thirties output of the House of Paquin. Despite Jeanne Paquin withdrawing from the house in 1920, her ethos of intense visual quality remained in place. The demanding cut and drape of Durran’s gown is characteristic of Paquin’s sumptuous pre-war collections. The sight of posh Keira Knightley swathed in emerald green silk has encouraged a revival of the classic Hollywood look in all social circles. However it is rarely flattering unless constructed with imense skill. This dress is an enigma, the pinnacle of unreachable elegance. It is meant to be adored, not worn. For a more indepth look at the construction of the dress visit The Costumers Guide. Pingback: Emerald City | HighStreet Blog. Hello, I recently discovered my love for film costumes. In my research I stumbled upon your blog and I am utterly in love with it. Keira’s green dress is lovely, but I’d love to know about another dress from another movie, in fact. 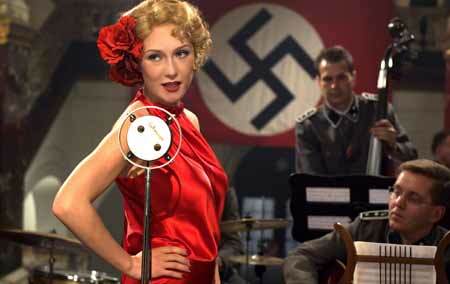 It is the red dress the female main character (Carice Van Houten) of Black Book (Zwartboek, 2006) wears at Hitler’s birthday party. If you could post about it I’d be forever grateful! Thanks for the love, Screen Addict. The stunning Carice Van Houten indeed wears an equally stunning red dress in Zwartboek. I’d love to do an article on it. Leave it with me and keep popping back…it’s on my list. Of course I’ll keep on popping back. As I said, I’m utterly in love with your blog; and I’m reading each one of your posts. wonderful blog theme man! I found your site via Gigi Sews, another wonderful blog. the details and historical info plus links are all greatly appreciated. I have a book, “Costume design in the movies : an illustrated guide to the work of 157 great designers” on loan from the library, mostly costumes from old to very old movies – really great photos to drool over. i should really post a few images on my blog. ciao! Thanks, Gia. Glad you’re enjoying my humble site. Keep coming back and have a good trawl round those archives. Wow! What an informative and thoughtful essay. I loved this dress when I first saw Adaptation, and as I kept reading on it seemed even more divine. Great dress, great website! I’d love to know who makes the dress Keira Knightley wears in the movie “Last Night”. I know it’s a rather obscure movie but I absolutely fell in love with the simplicity yet eternal grace of that blue silk wrap dress. Thank you. Hopefully that’s one we will cover in the New Year. Feel free to keep reminding us. Any news yet on that wonderful navy blue silk wrap dress from the movie Last Night with Keira Knightley? I am also dying to know! Pingback: Snowbird Takes Flight | Did You Make That? Was there ever an update on the dress from Last Night? Interested in where to find one that’s similar. Thanks!